EPA recently proposed a final pollution reduction rule for refineries that will help cut toxic air emissions and improve monitoring at the nation’s largest industrial facilities. This new rule is an important complement to the state level carbon and air pollution limits we have in California, and together will make our state cleaner, healthier, and more prosperous. Any doctor will tell you that to fight the toughest diseases you often need a combination of treatment options. The clean air laws we have in California are an indispensable part of the cure for our air pollution problems. But to be fully effective, they need complementary policies from Washington. Central to the challenge is the fact that large refineries are all too often found in disadvantaged communities – and release greenhouse gases, carcinogens, neurotoxins, and hazardous metals. Even though our state has been regulating refineries for decades, millions of Californians are still exposed to dirty, dangerous air. The puzzle of how to protect our communities is still missing pieces. What is needed is direct federal attention to oil refineries. With an EPA standard that is based on the most up-to-date pollution control technology and a new health impact analysis, we can cut pollution and ensure the communities living next to refineries have healthier air and more information about what they’re breathing. Cleaning up refineries will also have a positive impact on climate change. Research shows that reducing non-carbon pollution from refineries will also create carbon reductions because most solutions require more efficient equipment, better energy management, and modernized industrial processes. According to the U.S. EPA, the new proposed final refinery rule will cut 5,600 tons per year of toxic air pollutants and 52,000 tons per year of smog forming VOCs while also reducing 700,000 metric tons of CO2 nationwide. EPA’s new rule is an important step in the right direction for refineries because it will require toxic air pollution reductions, increased fence line monitoring, and improved public health impact analysis. EPA’s rule, however, can be further strengthened by addressing the refining industry shift towards processing dirtier crude oils and the need for improved safety systems across the board. As stated in EDF’s testimony at a public hearing earlier this month in the Los Angeles area, robust EPA standards, can provide a needed backbone for community protection in some of California’s most polluted cities. 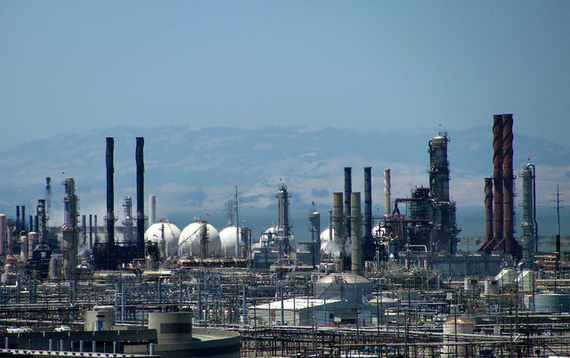 Refiners may say they can’t clean up their pollution, yet the data and history prove otherwise. Similarly, in October 2013, a report from NRDC found that continual improvements in the efficiency of U.S. refineries could reduce energy use by 13 percent by 2020 through adapting commercially available technologies. This sector’s potential for energy efficiency is as high as 26 percent if best practices and state-of-the-art technologies are used. The EPA rule is only one of many interlocking pieces needed to provide cleaner air in our communities. To be effective, measures such as strong federal mandates, state rules that require efficiency audits for refineries, and state rules that incentivize efficiency upgrades by limiting greenhouse gas emissions need to work in tandem. Citizens in California and across the nation deserve a better environment, and policymakers from both federal and state government owe it to them to do their utmost to enact robust and comprehensive policies. If you would like to learn more about the proposed final refinery rules, please visit the U.S. EPA website, or read EDF’s testimony.